I spend a lot of time talking about gay marriage. Thinking, writing, teaching about the history and critiques of the idea that marriage is a political issue, a civil right to be fought for; reading and engaging and discussing queer critiques of marriage on Facebook and Twitter, in conversation with friends and family, in classrooms. I’m also a bit of a closet romantic. Well, perhaps not so closet any more. I tend to find myself weeping helplessly when I see pictures of queer couples growing old together. I tend to think that it’s possible to wax sentimental and joyous about partnership on a personal level while acknowledging everything that is wrong with marriage as a political horizon for activism. And last weekend, two of the people I most admire in the world invited me to be a part of their very queer and very geeky wedding celebration. 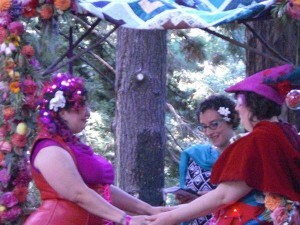 It was a weekend in the redwoods in Northern California, and included some of the best features of academic conferences (a roundtable on queerness and marriage) and fan conventions (a vid show with new fanvids premiering inclucing Radioactive (Wizard of Oz) ) as well as the traditional dancing, speeches, and cake. There was a time travel theme; there were costumes. I’m sharing the speech I wrote for the ceremony, because I feel like I was trying to articulate all the convergences of queerness and science fiction at their most utopian. We are gathered here today at the convergence of queer space, queer time, queer love. We are here at the meeting of past, present, and future. And what is a wedding in all those temporalities? In the past it has been the passing of a woman from the care of one man to another; the forging of an economic and social unit. Our present leaves that past behind, but we still feel the merging of two into one. The marriage we are gathered here to honor today is part of a different worlding, part of imagining something new that the project of union could become in the future that we want to create together. We are here in the wake of laws that say Julie and Melissa’s partnership has legal ground. Yet that is not why we are here. Authority is not vested in me by a law or a church. It’s something we all hold, together, a recognition we give to Melissa and Julie in our collective joining, our collective joy. We are here for Julie and Melissa and yet it is the gathering, all of us in this place, that matters most. Each of us, partnered and unpartnered and every way of being in between, can feel the bonds that bind us celebrated in today’s declarations. 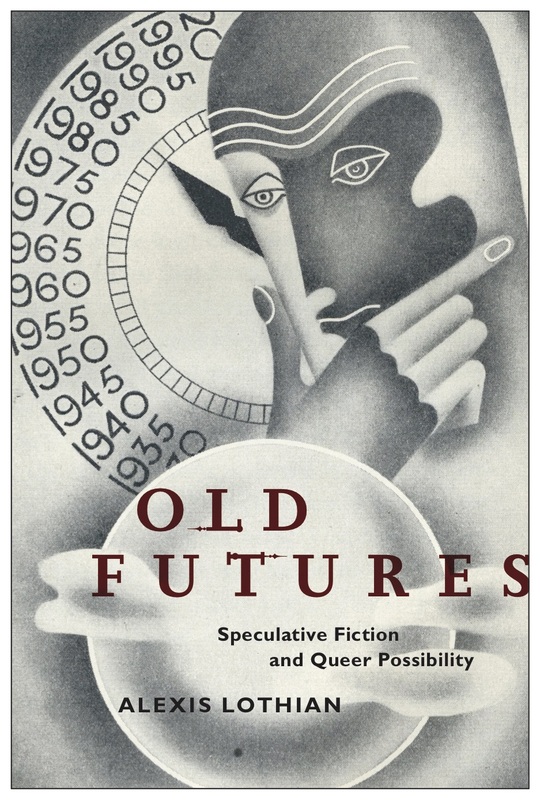 I searched the future for examples for today: queer and feminist writers’ speculative imaginations. In Ursula K. Le Guin’s The Dispossessed, lovers come together in a far future anarchist utopia on a moon. They see one another and know they are what they need. Then they take a new room together, select a new suit of clothes from the collective repository. The description of their love is lyric, awesome; but there’s no ceremony to re-enact. They don’t need one, and yet we, if not they, have more than subsistence needs –– a ceremony, a ritual, a making of joy to share and keep when we’re living day to day outside of utopia. Melissa and Julie’s story is a queer speculative fiction in itself, reaching one of many climaxes in this utopian weekend. They met unknown to one another, inhabiting a story of imagined future love between two powerful women on a space fleet desperately seeking home among the stars. They discovered the layers of one another amid lines from feminist theorists of science and technology, the convergence of intellect and embodiment among fictions of cyborgs. They passed themselves, words and images, through fibre optics and ethernet cables, through wireless waves of digital connection. And then their bodies also met, their lives joined geographically, and they wove their paths together: in the flesh from California to Rhode Island to Massachusetts and now to Washington State, while their digital dreams continue to expand and remix through time and space. The sweet and powerful positive obsession can be many things; today it is partnership and love. We are here to celebrate Julie and Melissa, to bear witness to their joining. We are here to collaborate with them in producing this time and this space for all of our memories — to talk, to listen, to watch vids, to walk among the redwood trees, to eat, to meet new friends and reconnect with old ones. We are here because we are part of one or more of the worlds of Julissa; because we are their fans. Because we ship them. Because JPeg the cat invited us. Because in the weird old nexus of personal and political anxiety that is marriage in the present, we know that there are worlds and futures worth having to be made. Lovely! Excellent speech, and I do think that ceremonies and celebrations to mark important events really matter.